The product serves in the line of AC 50HZ, rated voltage 230V and rated current up to 40A to automatically and immediately cut off power supply once someone suffers from electric shock or leakage current above specified value. It can effectively protect personal security and avoid the damage to equipments. 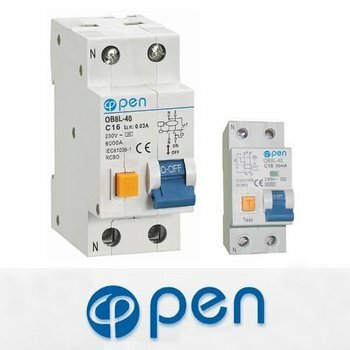 The circuit-breaker can also function as overload and shortcircuit protection and unfrequent changeover of line under normal condition. The product is conformity with GB16917.1,IEC61009-1 standards. 2. Rated residual operating current: 0.01A, 0.03A, 0.1A, 0.3A. 3. Tripping characteristics: B(3ln5ln), C(5ln10ln). 4. According to behaviour in presence of d.c. Components:Type A, Type AC. 1.Without auxiliary power supply, the product is designed with strong immunity and extending protection range against residual current. 2. With higher rated ultimate short circuit, up to 6KA. 3. Reliable, accurate and convenient adjustment of product instantaneous action is ensured. 4. Service life of product has been greatly enhanced through specially designed trippingmechanism.